In Terms Of attended the following events during calendar year 2013. The Kitchen L.A.B. : Eileen Quinlan, Mónica de la Torre, Adrienne Truscott, and C. Spencer Yeh, the Kitchen, New York, NY. Lauren Nakadate, Visiting Artist Lecture Series, New York University, Steinhart Department of Art and Art Professions, New York, NY. Lane Relyea and Katy Siegel in Conversation: Your Everyday Art World, Regina Rex, Ridgewood, NY. Southeastern College Art Conference, Koury Convention Center, Greensboro, NC. Mark Mazower in a Conversation with Will Self—illustrated by Readings—about Fact, Fiction, and the Dialectics of Organised Violence, The Writing Lives Series, Heyman Center for the Humanities, Columbia University, Buell Hall, East Gallery, New York, NY. Brian Droitcour: Vernacular Criticism, New Museum of Contemporary Art, New Museum Theater, New York, NY. Randy Cohen: The Ethics of Being an Artist, Professional Practices Series, New York Academy of Art, New York, NY. Mika Tajima, AMT Visiting Artists Lecture Series, Parsons the New School for Design, New York, NY. Salon: Henrjeta Mece and Saša Tkačenko, International Studio and Curatorial Program, Brooklyn, NY. The Kitchen L.A.B. : A. K. Burns, Dan Fox, Maria Hassabi, and Liz Magic Laser, the Kitchen, New York, NY. Roberta Smith: Art Criticism Today, Professional Practices Series, New York Academy of Art, New York, NY. Who Is Jack Goldstein?, Jewish Museum, Scheuer Auditorium, New York, NY. 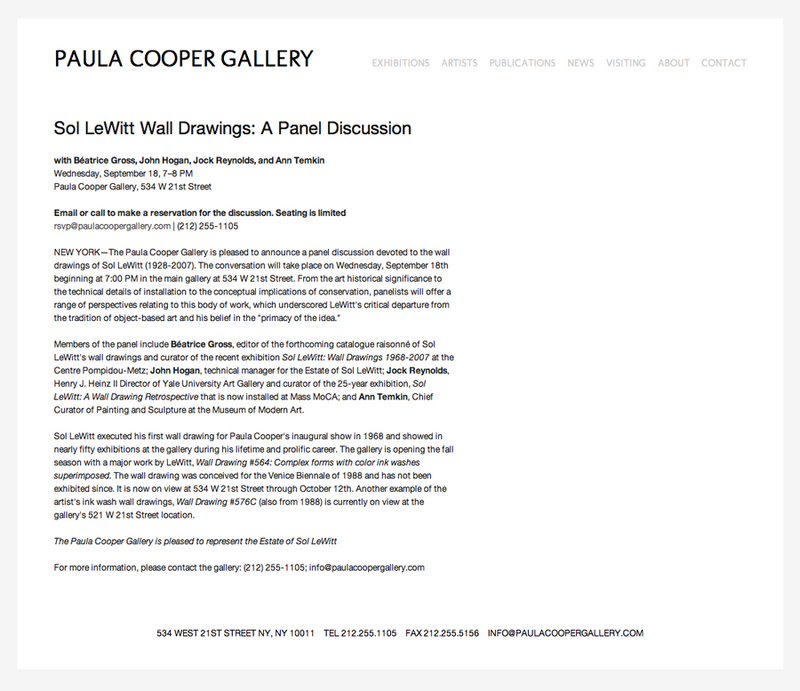 Sol LeWitt Wall Drawings: A Panel Discussion, Paula Cooper Gallery, New York, NY. The Edge of Vision Revisited: A Discussion with New Voices, New Work Series, Aperture Foundation, New York, NY. 9.5 Theses on Art and Class with Ben Davis and Special Guests, Housing Works Bookstore Café, New York, NY. Artist Talk: Caitlin Cherry, Brooklyn Museum, Brooklyn, NY. 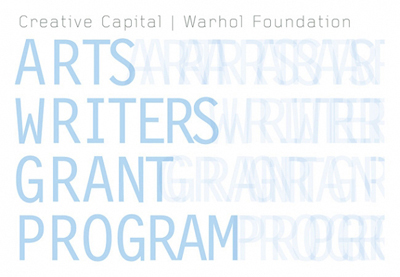 New York Practice, ICI Curatorial Hub, Independent Curators International, New York, NY. Tao Lin, Tapei: In Conversation, BookCourt, Brooklyn, NY. An Evening of Big Feminist BUTs, Housing Works Bookstore Café, New York, NY. Dennis Oppenheim: Form-Energy-Subject, Screening and Conversation, Electronic Arts Intermix, New York, NY. Networked Institutions/Institutionalized Networks, Museum as Hub Conference, New Museum of Contemporary Art, New Museum Theater, New York, NY. Institutions after Art, Museum as Hub Conference, New Museum of Contemporary Art, New Museum Theater, New York, NY. How Do You Feel (About Institutions)?, Museum as Hub Conference, New Museum of Contemporary Art, New Museum Theater, New York, NY. Choosing Your Neighbors, Museum as Hub Conference, New Museum of Contemporary Art, New Museum Theater, New York, NY. Contemporary Art: 1989 to the Present: A Roundtable Discussion, New Museum of Contemporary Art, New Museum Theater, New York, NY. The Work of Art Criticism in the Age of Blogs and Ezines, 101st Annual Conference, College Art Association, Hilton New York, New York, NY. Developing a Fair Use Code for the Visual Arts, CAA Committee on Intellectual Property, 101st Annual Conference, College Art Association, Hilton New York, New York, NY. The Impact of Contingent Faculty: Changing Trends in Teaching and Tenure, 101st Annual Conference, College Art Association, Hilton New York, New York, NY. Book Reviews and Beyond: caa.reviews at Fifteen, 101st Annual Conference, College Art Association, Hilton New York, New York, NY. Art Criticism: Taking a Pulse, 101st Annual Conference, College Art Association, Hilton New York, New York, NY. Education/Algorithms: Art.sy Talks about the Art Genome Project and Discovering Art Online, 101st Annual Conference, College Art Association, Hilton New York, New York, NY. Art Criticism and Social Media, International Association of Art Critics, 101st Annual Conference, College Art Association, Hilton New York, New York, NY. Organizing in the Culture Industry, Part I, Arts & Labor Strategy Discussion, P!, 334 Broome Street, New York, NY.